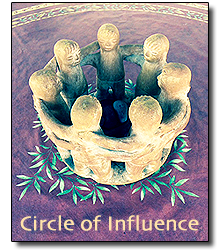 Important because our “circle of influence” is important…very important. We’re a unique tribe of independent, creative thinkers. And it’s empowering and motivating to have regular, deep conversations with other like-minded independent artists & entrepreneurs who are confronted with similar concerns, share similar goals, and experience similar angst. And if we can’t find any like-minded peers, then we need to manifest or create a regular, on-going conversation with a personal confident, mentor or experienced coach who understands the entrepreneurial angst we go thru, and has the audacity to consistently encourage us and point us in the right direction.